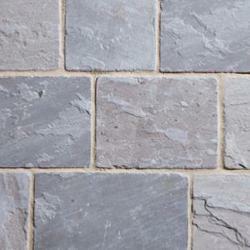 Cinder is a lightly riven block paver, made of a rumbled sandstone to create a weathered look. Cinder has a pallet of varying grey tones and can contain buff and brown shades that can come to life as it is exposed to the elements. To match a patio to a Cinder driveway, try Platinum or Pumice flagstones, each have similar tones but different textures to suit, see Premiastone collection for more details.